Here are other stallions available for your consideration. 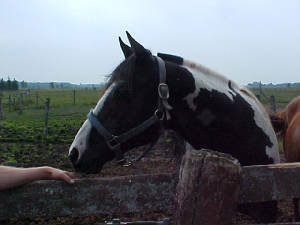 He is a 14.3 hand black bay Tob/Overo stallion. He is by APHA stallion Cons Midnight Bar and out of AQHA mare Miss Ready Fit. He has many greats in his bloodlines! Leos Midnight Sun, Contraversary Bars, Conclusive, Impressive Tommy, and Wiggy Bar Montleon. 2006 stud fee $350 for all APHA, AQHA and TB mares. 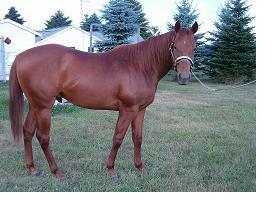 Continental Slew is a 16 hand sorrel stallion. "Rocket" has correct conformation, big boned, nice deep hock, fluid mover, and a great temperment. My 3 yr old daughter handles him. His bloodlines include On The Money Red, Seattle Slew, The Continental, and Count Zero (x Johnny Zero) How can you pass up running lines like that? He is in training for barrel racing and I have high hopes to get him to AQHA world like his sister! With his size and movements I am sure his foals could be both barrel and pleasure prospects, and the size of a hunter jumper. 2006 stud fee is 350.00 with 50.00 booking fee. He is approved to breed AQHA and APHA. 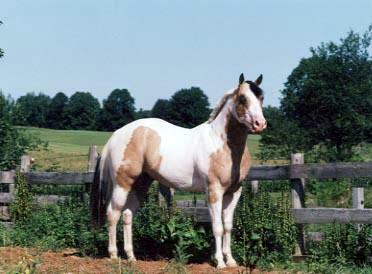 APHA # 00560776 Buckskin Tobiano. Can you say "GORGEOUS"! Rio is 15.3 hands with an INCREDIBLE temperment. 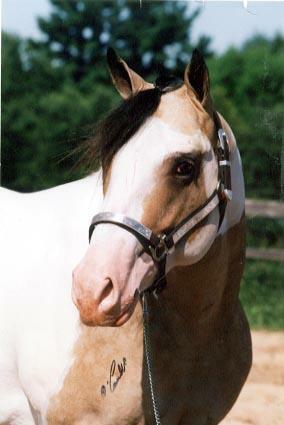 Rio's bloodlines include double Hank A Cheif, along with Bill Cody, Leo Bid (by Double Bid), Cherokee War Cheif (by Leo San Siemon), Zan Parr Bar, and Docs Benito Bar. His 2006 stud fee is $200.